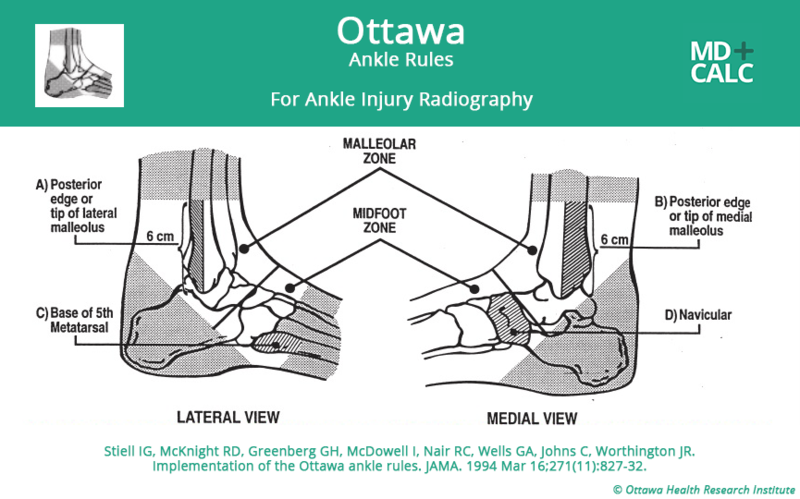 Prior to the creation of the Ottawa Ankle Decision Instrument, most patients presenting to the Emergency room with a complaint of acute ankle injury had ankle and or foot radiographs ordered to evaluate for fracture, even though the incidence of fracture among this population is relatively low (~ 15%). While ankle radiographs do not expose the patient to large amounts of radiation, they do incur costs for patients, costs for the health care system, increase length of stay and contribute to Emergency Department crowding. Clinical decision instruments can help clinicians decide which patients do not need imaging without missing clinically significant fractures. Can a decision instrument help determine which patients with acute ankle injuries do not need imaging thus reducing the use of ankle and foot X-rays? Adults >18 presenting to the emergency room with blunt ankle injuries including twisting, MVA, fall from height. Standardized clinical assessments were filled out on 32 different variables by trained assessor physicians prior to undergoing radiography of either ankle, foot or both. A second trained physician assessed the patient as well to evaluate for inter-observer variability. After finding variables with the highest correlation that also had kappa scores or inter-observer agreement of at least 60% greater than chance, they applied a recursive partitioning model set with 100% sensitivity and allowing for low specificity. The final model was chosen for simplicity as it had the fewest number of variables. A similar technique was used for mid foot fractures. A potential savings of 36% of ankle radiographs, and 21.3% of foot radiographs could have been achieved by using this rule. This was a high-quality study with a good sample size. The final decision instrument had excellent sensitivity for detecting clinically significant fractures However this study is only derivation, and at the time of original publication had not undergone any validation, indicating it was not ready for use in clinical settings. Subsequent studies have validated the rule in multiple clinical settings (Stiell 1993, Stiell 1994, Stiell 1995), as well as in children (Plint 1999) who were not included in this original derivation study. Impact analyses have been completed as well indicated that this decision rule informs the decisions made by many physicians, however while 91-99% of US emergency physicians are aware of the rule, only 32% report that it informs there clinical decisions. This article was named one of ALiEM’s Landmark Articles (www.aliem.com/52-articles-in-52-weeks-landmark-em-articles-2013/). It has become an integral part of how many physicians in the ED assess patients who present with ankle and foot injuries. 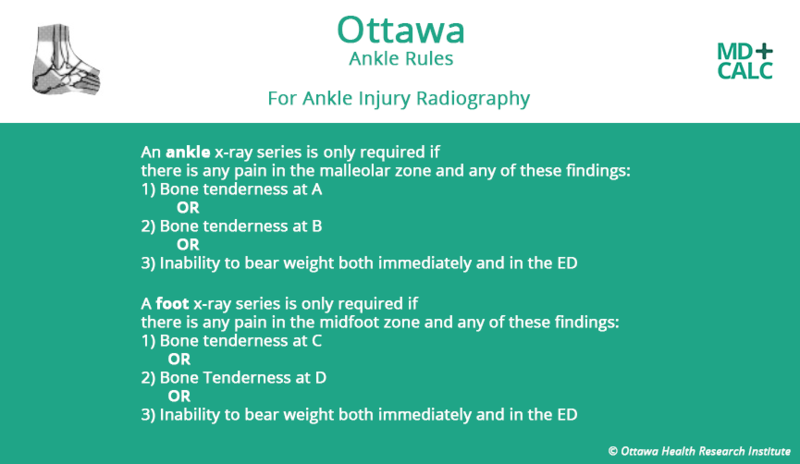 The Ottawa ankle decision instrument is a highly sensitive tool for determining which patients do not need imaging performed.